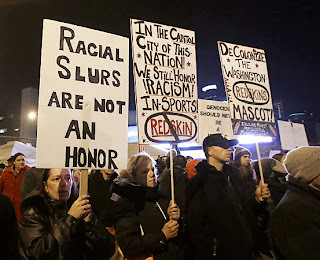 On November 7 over 800 people turned out in protest against the racist name of the Washington "Redskins" football team. The protest was held just before the Washington team was scheduled to play the Minnesota Vikings at the Metrodome in Minneapolis. 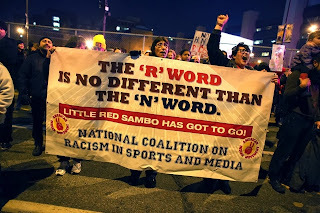 The event was organized by the American Indian Movement, the National Coalition on Racism in Sports and Media, Idle No More and other activist organizations. People from around the region gathered for the protest, which began at the American Indian Center in the heart of Minneapolis's Native American community. From there protesters marched to the Metrodome. This isn't the first time that protests have been held in the Twin Cities to protest racist names of sports teams. For example, there was a protest against the Atlantia "Braves" when they played the Minnesota Twins in the 1991 World Series. There was also a protest at the 1992 Super Bowl when the "Redskins" played the Buffalo Bills in Minneapolis. Recently the movement against racist sports team names has been gathering momentum. 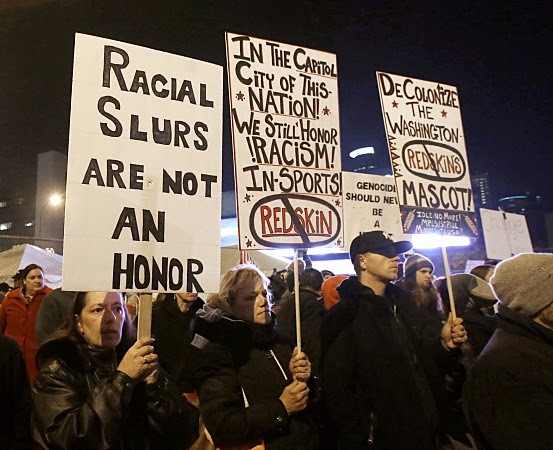 Even a number of elected officials, such as Minnesota Governor Dayton and Minneapolis Mayor R.T. Rybak, have felt compelled to recently come out and declare that "Redskins" is a racist name. The credit for this growing anti-racist sentiment belongs to the activists who have labored for decades around this issue. We salute the organizers of the November 7 protest, and pledge our support to the ongoing movement against the racism in American society of which racist sports team names are just the tip of the iceberg. > The article above was written by Adam Ritscher.